① Super comfortabel to sit on it. ② Height can be adjustable for easy operation. ④ Polished chrome finish that is super durable. ⑤ Ergonomically designed that is easy to use. ⑥ Widely using for hairdressers, beauticians, barbers, dentists, tattoo makers and more. 1.Please allow 2-3mm measure error. We value our customers and wish to make your purchase experience as enjoyable as possible. If something goes wrong with your product, please do not hesitate to contact us for assistance. ✅ 【SIT SMART】Hydraulic Massage Stool isn't just a stool, it's a tool! It's ergonomic design, world class components, and quality construction help you to work, learn, and play more effectively. 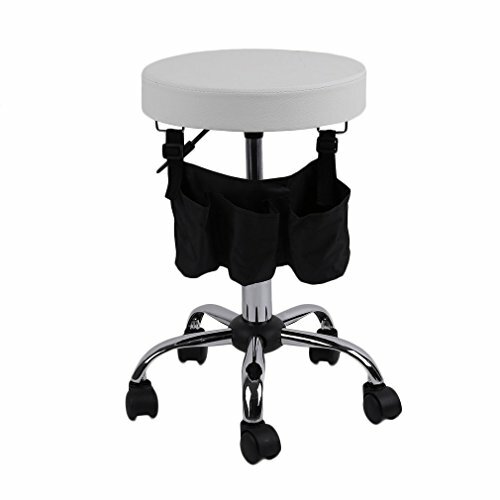 ✅ Handy and comfortable swiveling stool. A real multi-talent for your office, desk and many more areas of application! Perfect for reiki and other massage, also suitable for hair salons, beauty parlors, tattoo studios and many more【360 DEGREE SWIVEL】Pivoting seat swivels 360 degrees giving you the ability to switch directions, back and forth as needed, with ease. Ideal for professions or hobbies that require repeated swift movements or changes in orientation. ✅ 【COMFORTABLE】Firmly cushioned thick seat provides support without being too stiff or hard. Seat is initially firm, but softens over time and forms to your body's unique contours for added comfort and flexibility. ✅ 【SMALL AND CONVENIENT DESIGN】Compact design makes this stool ideal for use in small spaces where extra seating is needed. Can be easily taken apart for travel or for moving purposes, then easily put back together. ✅ 【MULTIFUNCTIONAL】Stool is great for use in barbershops, hair salons, tattoo parlors, doctor's offices, schools, offices, warehouses, home or automotive garages, behind the counter of retail spaces, and more!